Autoflip is an advanced sheet music viewer that automatically turns the pages in sync with your performance by actually listening to how you are playing. It can account for variations in tempo as well as minor mistakes. Autoflip version 1.0 is optimized for solo performances using pianos and keyboards. 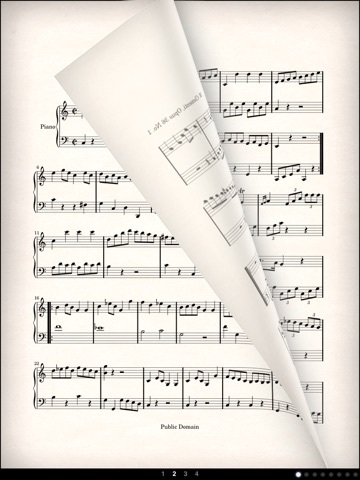 Autoflip works with any sheet music in PDF format. You can enable automatic turning for each new piece by running it through a simple training session. A training session is simply you playing the piece and turning the pages! After that, all you have to do is play and Autoflip will take care of the turning. 1) Basic meta-data editing to organize your collection. 3) Ability to add new sheet music through iTunes as well as "Open in... autoflip" from iPad's built-in browser.